Ah, the election is over! Those living outside the United States might not understand the relief, but as a minor example, we had six different phone calls urging us to support Todd Akin for the Senate in the 24-hours before our polling station closed. I am not sure that there will be much in the way of new information on Energy Policies out of Washington for a while as they debate the fiscal cliff, but one does wonder whether we might get a new Secretary of Energy. And so, with Iranian oil production very much a function of how effective sanctions remain, and with the new OPEC Monthly Oil Market Report due, I am going to return for a second week to discuss the geothermal operations at MS&T with a little more detail than last time, since some of the numbers might be of interest. (And I am grateful to Jim Packard at MS&T for providing the information). Universities generally move very slowly. However, they are on occasion willing to accept new ideas to resolve a problem quickly. (We once had to build a small plant to recover explosive and repackage it – not something that was possible above ground, but by driving a new set of tunnels underground at the Experimental Mine, we could create space for the plant and then operate it for the required demonstration without needing any of the permissions required had we tried to build a facility on the surface. This was about 20 years ago, and we would likely still be moving the paperwork seeking permission to build above ground. Perhaps this is another argument for the accelerated use of underground space). The case for a change in thinking, and perhaps a hint of its urgency, can be seen by looking at the energy balance before the new system is installed. Given that fuel costs will likely only continue to rise, that a new boiler was needed, and there was no obvious source of funds to pay for it, a number of options were considered. It is interesting to note in the following table, the costs of the current coal:wood system (60% coal) relative to those of the proposed water to water (WTW) heat pumps being proposed. To digress a little, in addressing a similar problem, the University of Missouri at the Columbia campus is installing a bubbling fluidized bed boiler. The boiler will use biomass to displace about 25% of the coal use on campus. The $75 million project has just been completed. However, as I noted in an earlier post, there may be unrecognized processing costs for the biomass, which may eat into the campus savings. And while MS&T are looking for ways of handling the now unnecessary smokestacks, the biomass facility in Columbia has just added three 110-ft tall silos to handle the feed. 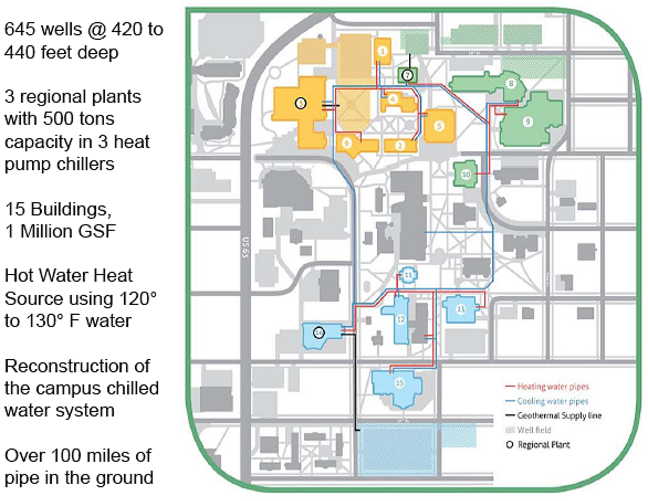 The new boiler, which was retrofitted to the university’s existing heating duct system, is expected to produce 150,000 pounds of steam per hour, increasing the 67-year-old power plant’s steam output by 30,000 pounds per hour, and use an estimated 100,000 tons of in-state renewable energy sources such as chipped hardwoods and wood waste. Back at MS&T the numbers for the heat pump came in part from a WTW heat recovery chiller that the campus had installed in October 2007, which saved the campus some $1,500 a day by allowing some of the recovered heat to be produced in useful form. When the campus first looked at the potential, they also looked at the experiences of institutions such as the Richard Stockton College of New Jersey, which installed a system in 1996. Their installation pioneered many of the decisions made in subsequent operations. The wells are located on a grid and spaced roughly 15 feet apart. Within each four inch borehole, the installers placed two 1.25 inch diameter high density polyethylene pipes with a U-shaped coupling at the bottom. After the pipes were installed, the boreholes were backfilled with clay slurry to seal them and to enhance heat exchange. In total, the loop system includes 64 miles of heat exchange pipe. In addition, 18 observation wells were located in and around the well field for long-term observation of ground water conditions. The individual wells are connected to twenty 4-inch diameter lateral supply and return pipes. The laterals, in turn, run to a building at the edge of the field where they are combined into 16-inch primary supply and return lines. These lines are connected to the heat pumps which serve Stockton’s buildings. In the heating mode, the loop serves as a heat source and in the cooling mode, as a heat sink. The heat pumps range in size from 10 to 35 tons. All are equipped with air economizers. The equipment is controlled by a building management system using 3,500 data points. This allows the college to take advantage of energy-saving options such as duty cycling, night setback, and time of day scheduling. The building management system also identifies maintenance needs in the system. . . The system immediately demonstrated that it could carry the entire planned heating load. In the first few years of operation, the average temperature of the well field has drifted upward by several degrees. This occurred because the buildings use more air conditioning than heating. . . . . .
Because of the constant changes to the system, and other energy conservation steps, it was difficult to verify energy savings exactly. Based on extensive monitoring, the predictions turned out to be quite accurate. Once a well had been drilled, and the pipes installed, the holes were backfilled with a grout that included significant quantities of sand, to improve the heat transfer. And the two pipes were all that were left protruding. 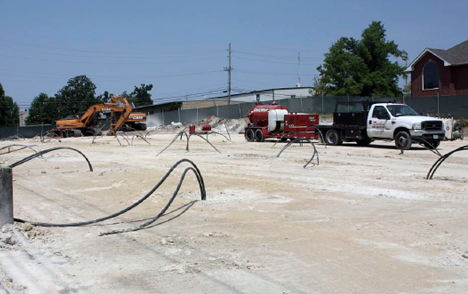 Trenches were then cut across the lot to allow the distribution and collection network of pipes to be installed. 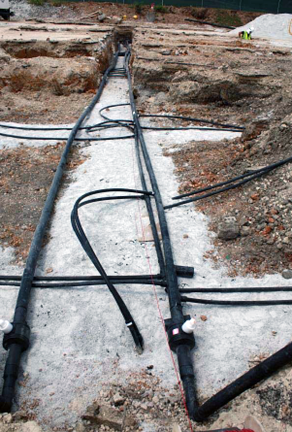 Once the field connections were fused together, the lines were connected to larger transport pipes at the end of the field, and set into a deeper trench. The larger pipes were used to carry the water from each field to the heat exchanger/chiller plant, with three plants being located around the campus. 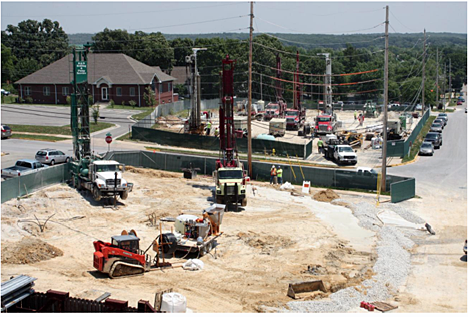 All that then remained was to backfill the trenches, tarmac the lots again, and the campus began to return to normal. The last well did not get drilled until half-way through this semester, but the lots are now coming back into use. With most of the work done on the fields, the remaining work involves the integration of the system into the existing infrastructure, and the necessary changes to the hardware in the various buildings to handle the different ways in which energy is used within them. Much of this change is required since the heating has been using steam lines in the past, and these have to be replaced now with the hot water circuit. The underground mining tunnels beneath that feed the pit are extensive and go below sea level from Butte's mile-high altitude, providing a great heat exchanger. Since the water will have to be treated in perpetuity, a technology that would extract the heat (and the dissolved minerals) would be welcome. is what gives me pause when considering Pebble Mine. I don't think 2.5pH sanitizing water would be a very good mix in the communicating ground water system that is among the head waters home to the last large wild salmon run left in the world...nor do I think the abstract concept of 'in perpetuity' mixes well with the concrete reality of corporate balance sheets. But more to topic. Congrats to MS&T and all other institutions following that path. We just put in about a 1/2 mile more of buried 8' x 8' concrete utilidor to handle more steam lines and power cables from the UAF coal plant. That cost a heck of chunk of change. We are in the subarctic where 14,000 heating degree days makes for way too unbalanced a load for standard ground source heat pump operation but such systems seem a no brainer in more temperate climates. The grade school my kids attended is experimenting with ground source heat pump/solar thermal combo on the south side of the hill on which we live. Time will tell whether the numbers pan. You can store the heat of summer under your house in the soil, it is a good thermal store. Heat pumps put it there and heat pumps take it back out in the winter. There is a housing complex in Canada that works on that principle. If you add solar thermal, you get even more heat captured and stored. We can trade hardware for energy. We evolved brains, it is about time we used them to our advantage and quit wondering about global warming or conflict in the middle east. One dedicated soul here is doing that. It made a bit more sense for his full solar exposure (which is a different animal at near 65° N) offgrid house, but the payback time can be daunting. I gave my location a good lookover this last year and even cutting down every tree to the edge of my property (something I will not do) would not overcome the ridges east and south of me. Latitude makes a difference to how good a location has to be. Sunny Edmonton, Alberta is quite a bit less touchy being way down in the warm (10060 heating degree days--that's even less heating load than Anchorage has) south (53.5°N). Biomass going through a wood pellet boiler is as good as my house is going to get. The above chart is from GVEA, our local co-op. GVEA hoped to have the Eva Creek wind project in operation by the end of October, but the commissioning schedule slipped slightly--delayed by a lack of wind. That article was from three weeks ago, couldn't find a fresher one. What is the life expectancy of your polyethylen tubing ? How long until loss of circuit integrity ? 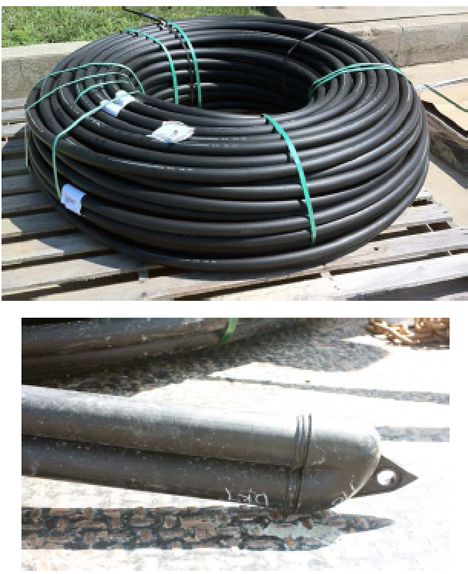 Fortunately, the HDPE tubing is available in long rolls, minimizing the number of joints. "warranties up to 50 years". Their standards only allow polyethylene and PEXa pipe for loop fields. which is a high grade high density polyethylene. Three ways for this to fail, since it's buried and no sunlight (UV, UV -> ozone) to degrade it. Highly unlikely, unless one has a nearby leak of some nasty solvent (HDPE resists many organics). Older resins are susceptible to chlorine and other oxidants in domestic water systems, but that is not applicable to a closed loop system. If reasonably well installed (not bent/notched, and well bedded in the backfill or grout to avoid too much stress), this too is unlikely, due to the properties of the specified HDPE resins used, and the high safety factor and typical low operating pressures (100 psi or less). The "small" size of the pipe means that the fused joints are under less stress, limiting the possibility of stress cracking. The low and stable ground temps also put less stress on the pipe. (3) degradation of the polymer. HDPE and other polymers will slowly oxidize from ambient oxygen (in groundwater) and degrade. Since this is chemistry, the lower the temperature, the slower the process. Based on this paper about geomembranes (liners for landfills), at 20 degrees C (68 deg. F) - a relatively high ground water temp, the HDPE geomembrane has lost half its strength in 446 years. but the loop field piping ought to last 100+ years. The heat pump units will only last 25 or so. Thank you for your exhaustive answer, Theoildrum is an incredible platform ! What happens when the grout and sand contact the pipe? Will there be abrashive "sanding" of the pipe from the mechanical vibration of the water through the pipe? The pipe really doesn't see enough vibration that would cause it to move that much once set in place. I am interested in this series of tech talk because I attended U of Missouri, Columbia from 1975 to 1980 and graduated with BSME degree. Had friends that went to the Rolla campus, some rivalry existed between the two schools. first comment: old boiler is 79% efficient which is bad for modern boiler. Should be at least 85% or even 90%. Second comment is why so much heat lost in system? Many old systems like this used asbestos brick (shaped to pipe) insulation. Adding a layer of fiberglass over old insulation would help stop heat losses that are nearly equal to the useful heat that goes into buildings and heats water. I would attack that problem first, then you could go with a smaller capacity heat system, saving even more money on installation and operation. 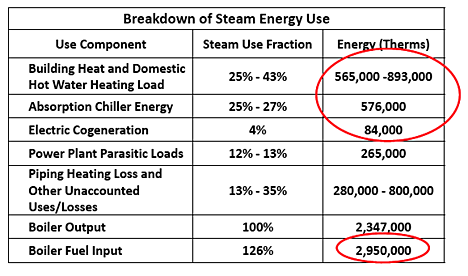 Edit: I am advocating replacing/upgrading insulation on pipes that move steam or hot water around campus to save energy, realizing old boiler must be replaced. 100,000 tons of wood waste per year will require at least 5000 truck loads to deliver. Considering that Columbia has no nearby forests that are being logged, most biomas will have to come from 50 to 100 miles away in SW or SE part of state. The 5000 truck loads (20 tons per truck) will consume at least 80,000 gallons of fuel per year while costing the U of MO around $2,000,000 for the trucking, plus cost of wood waste. With natural gas going for $3.50 I don't think much if any money is saved by burning biomas compared to nat. gas. This is mostly another "green" experiment that is really not so green. Missouri Science & Technology is using a much better approach with ground source heat. Gasify biomass close to the source, use natural gas for additional hydrogen then synthesize gasoline, diesel and jet fuel. Once you have added value to the biomass and natural gas, ship the product to where it can be used, this will reduce oil imports. There is a fair amount of wood processing around, where the waste now has somewhere to go, and there are other sources such as corn byproduct, so that part of the equation has been thought out before the change. The concern that I had was with storage, since (and it is raining outside as I write) much of the material wicks up a lot of moisture if left outside. 100 ft silos sound large, but as you note the volumes under discussion are quite large and storage costs may be a significant player - I'll see what I can find out for more details. The long-term heating trend for the reservoir would seem to be an issue. Of course as the temperature gradient increases natural heat flow will help limit the rise, but it still will hurt summer efficiency. Do such systems use a de-superheat circuit to extract useful heat (say for continuing hot water needs) during the summer? It would seem to be easy to include a water-to-air heat exchanger to reject excess heat when conditions allowed. With such a large field, might it be possible to design a thermal gradient across the field with multiple zones, switching flow paths between summer and winter to store some heat and coolth for the other season? How much does each degree of dump reservoir temperature equate, in terms of added or saved cost per day, I wonder? The manufacturer built a rooftop air conditioner – the Voyager DC – that is 40% more energy-efficient than conventional units, becoming the second manufacturer to achieve Western Cooling Challenge certification. “Since air-conditioning is the largest portion of electricity used during hot weather, the potential for 40% savings is enormous,” said UC Davis Western Cooling Efficiency Center associate engineer Jonathan Woolley. With regards to residential space heating, as noted before, our forty-four year old, 232 m2 Cape Cod is heated by two air-source heat pumps and last year their combined usage came to 3,829.7 kWh (and bear in mind our winters in this part of the great white north are even colder than those of Buffalo, NY). I should also point out that had we opted for best in class performance, i.e., the Fujitsu 12 or 15RLS2, we could have theoretically cut that by an additional 1,000 kWh. Oddly, Akin's main web page doesn't mention that he is a Republican. Must of been too ashamed to reveal that fact up front. But looking at his positions indicates he is a far right wing 1% percent type. Fortunately, Akin was defeated and will soon join the ranks of the unemployed..
What's the cost of electricity and what's the source? Will they preferentially draw power at night, and take advantage of lower rates (and tilt towards wind and nuclear)?